Reports on Wednesday suggested more than one iguana was actually filmed, with scenes then stitched together. But the BBC has said only one animal was chased by the snakes – with other iguanas only filmed for close-ups. The scene quickly went viral when it was aired last year and later won a Bafta for must-see moment. The iguana hatchling, filmed in the Galapagos, eventually got away – much to viewers’ relief. The Daily Mail claimed the episode was embroiled in a “fakery row” after producer Elizabeth White told the Media Production Show: “It wasn’t the same iguana, no, and often we have to augment it with other clips. But the BBC defended the Sir David Attenborough-fronted programme, with a spokeswoman saying: “The BBC strongly refutes any suggestion that the award-winning iguana v snakes sequence was ‘faked’. 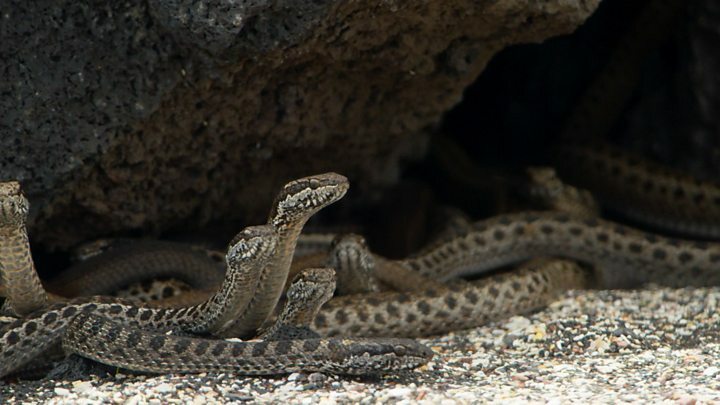 “The final iguana chase in which one iguana escapes the snakes was – unusually for natural history filming – shot using two cameras, allowing us to follow both the individual iguana and the snakes’ point of view. She added: “As is common in natural history film-making, pick-up shots were filmed separately – for example close-ups of iguana eyes – to make the story of the sequence as clear as possible for the audience. Other BBC nature documentaries have previously been accused of faking footage. Frozen Planet, also fronted by Sir David, showed footage of newborn polar bear cubs in a den with their mother in 2011 – but it was filmed in an animal park, rather than in the wild. The BBC denied misleading viewers, with Sir David saying it would have spoiled the atmosphere to point out where the filming had taken place adding: “It’s not a falsehood and we don’t keep it secret either”. And then there was the Blue Planet footage shot in a lobster tank – but the BBC said this was done to protect the environment.